Sharrows: those helpful little road markings that terrify drivers while making bicyclists feel inappropriately secure. The Seattle Department of Transportation (SDOT) has painted the cute double Vs onto numerous arterials and side streets in an effort to support bicycle commuting. I am all in favor of giving bikes the road and telling cars to bug off already, and for the usual reasons: cleaner air, healthier population, hipper culture, Busytown vibe. Bike commuting is the bomb, and our hilly streets make it even more cool. When we bike, we bike big! But back to the sharrows. The problem is that they provide little in the way of guidance and elicit much confusion. They are not traffic signs but rather traffic suggestions. They say to drivers: Bikes will be joining you, and don’t worry–they’re just like cars! They say to cyclists: This is a safe road to ride on, so enjoy! Bicyclists, don’t listen. You can’t do it. You will not reach that speed limit on your bike, and as a result you will create a line of cars behind you whose drivers are not sure whether to go around (is that allowed?) or hang back and stare at your rear end as you frantically pedal. 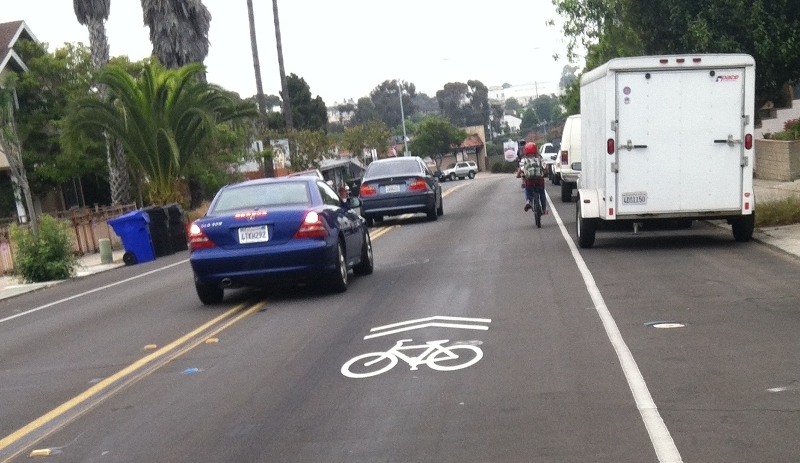 Cars veer around a ten-year-old bicyclist in a 30 mph zone on this San Diego street. Also, because of those parked cars, you’d be advised to stay in the center of the lane to avoid collision with a suddenly-opened car door. That makes it doubly hard for drivers to go around you. The sharrows, as the SDOT website helpfully acknowledges, are not bicycle lanes. They are simply “a guide” suggesting where you might place yourself among the cars. They offer, in other words, nothing in the way of protection. As for you, drivers: good luck. The bicycles you encounter will sometimes behave like cars, steering down the center of the lane, obeying traffic rules. Other times–for reasons physical, psychological, or mechanical–they will suddenly pull to the curb or hop up onto the sidewalk. Let them. Give them room. We all want to live to see another day. 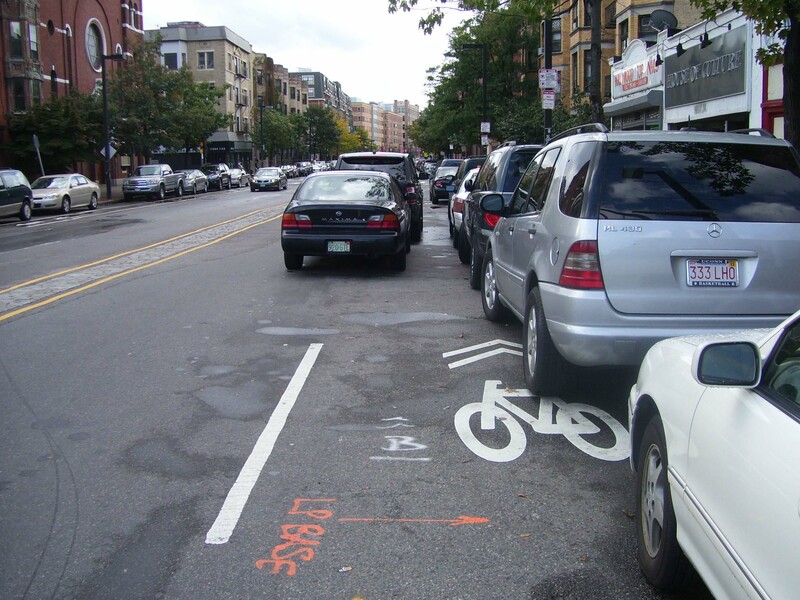 This sharrow in Boston is not even trying anymore. Conclusions: Painting up a road with bike icons, green lanes, and sharrows does not make it a safe road for bicyclists, any more than nailing a “no shaking” sign to the side of my house makes it earthquake-proof. Yet, what we really need — designated bike lanes, separated from both traffic and parked cars — is crazy expensive to implement. Until we get a bigger transportation budget or a forward-thinking benefactor (are you listening, Jeff Bezos?) I suppose we’ll have to live with the sharrows. They’re better than nothing, right? Just remember to take note of them, and then ride and drive as if they’re not there at all.